I recently needed to cut over 100 equally spaced mortises. To save time, I set up a stop on my tablesaw and cut identical mortise pockets with a dado blade. I then closed the mortises by gluing a side member over the dadoes. After trimming, the glue line was imperceptible. tiat tip win* $>on Know a better way of doing somethingi Designed a clever jigf Send your original woodworking tips, along with a sketch or a snapshot to: "Tech Tips/ Americas W(X)DWOKker, 33 E. Minor St., Emmaus, PA 18098. We'll pay 550 for each tip we publish and $200 for the best tip of the issue. glass (not the thin window variety) and glue ^/g-in.-dia. rare-earth magnets as shown, (available from Lee Valley, 800-871-8158). This is best done by laying the glass dircctly on a steel or iron surface, putting a drop of cyanoacrylate glue on the glass, then positioning the magnet. Magnetic force holds everything in place while the glue sets. Set the jig on the outfeed table, position the knife at top dead center so it contacts the leading magnets, and tighten the retaining screws. I replaced the metal guide blocks in my handsaw with guide blocks made from hard maple. 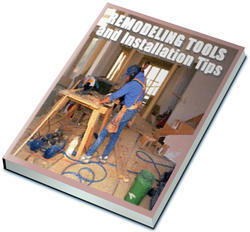 The wood blocks give excellent support to the blade without damaging the teeth. Also, when using narrow blades (Vg in. or less) I can bur)' the blade within the blocks for better control. 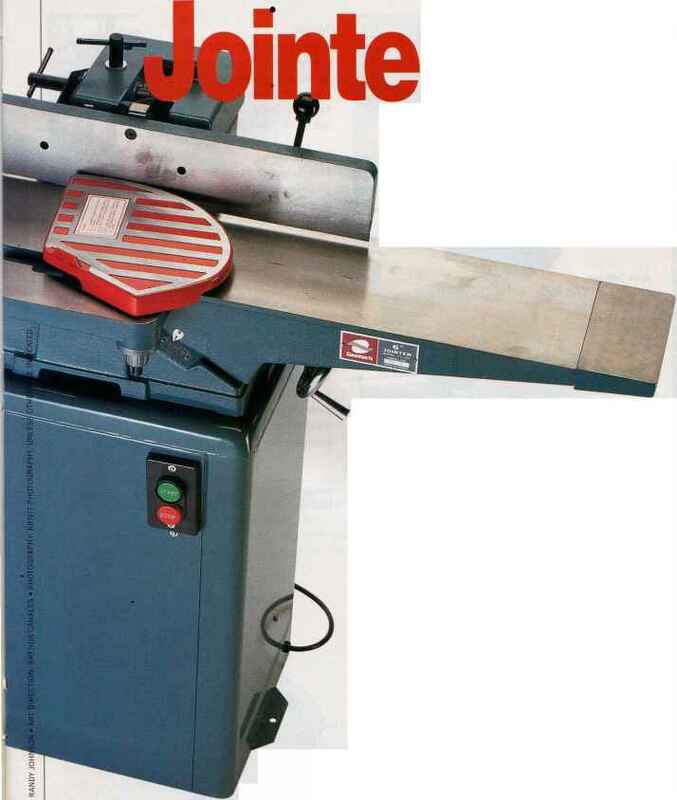 When the blocks become worn, they are easily replaced or trued up on a disc sander. and tap the plate for #10-32 machine screws. 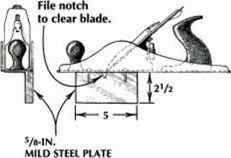 File a V-notch in the plate to clear the blade. Make a trial cut and adjust the skew of the blade until the edge of the board is exactly 90* to the face. After soaking my gummcd-up circular saw blades in solvent for a couple of hours, I "floss" the teeth. I do this by clamping the blade between two pieces of scrap and then running a piece of rope—braided cotton clothesline works well—back and forth in ever)' gullet and across every tooth. This removes the softened pitch much more effectively than a brush would.